GET ACQUAINTED WITH TERMS OF SHOPPING! Here are Kostimi.lv e-shop shopping rules or „Distance Contract”. Please read them carefully before placing your order. Place an order in our e-shop only if You completely understand and agree to terms and conditions that are stated below. If you have any questions, regarding these terms, please contact our client manager via telephone or e-mail. This agreement is entered into between MARKI GROUP Ltd. REG. No. 40003736171 and VAT REG. No. LV40003736171, Legal address: Apes street 5-25, Riga, Latvia, LV-1039, Reg. date: April 1st, 2005 (hereafter Kostimi.lv) and Customer who makes a purchase in Kostimi.lv Internet shop. Distance contract shall apply to all orders placed in Kostimi.lv online store. 1. General rules about ordering. 1.1. Kostimi.lv in their work sticks to good commercial principles and complies with "Consumer Rights Protection Law" of the Republic of Latvia and "“Distanced Trade” . 1.2. All products in Kostimi.lv e-shop include VAT of 21%, without shipping costs. Product’s price is the one indicated in the order"s invoice till commitments are completely fulfilled. 1.3. This agreement is obliged to all customers that place an order in the online shop. The concluded agreement is not saved in a separate file and is available to all customers in the section of „Shopping Terms and Conditions”. 1.4. We reserve the rights not to accept the orders for fulfillment from persons younger than 16 years old, as well as, from persons who deliberately have caused damage to Kostimi.lv or disregard the principles of morality and ethics. 1.5. The buyers must show truthful information about themselves. If the buyer’s data is incomplete or there is a reason to believe that the data is false, we reserve the right to not accept the order for fulfillment. According to legislation of the Republic of Latvia, users’ activity monitoring and recording is carried out (the sender"s IP address, user ID, time). 1.6. Product color may be different from the one showed in picture. It depends on computer color perception, screen brightness. The manufacturer reserves the rights to make minimal changes in the production process. For instance: to replace buttons or tabs to others than showed in the photo. Normally if any changes occur, they are minimal and do not affect the appearance. 2. How does the ordering process happen. 2.1. The order is placed in the online shop via the Internet. Orders are not accepted and processed via telephone or e–mail. 2.2. After placing an order, you will receive an automatic Kostimi.lv order confirmation in pdf format to the e-mail address indicated. If You have not received this confirmation, check ‘junk mail’ or ‘spam mail’. If the confirmation email is not found in these folders, it means that You have not completed all of the ordering steps and we have not received Your order (in this case we ask You to place an order again). 2.3. 24 hours after receiving the order, excluding holidays and public holidays, you will be contacted by customer service about your order confirmation. Foreign customers will be contacted via e-mail. Make a payment only after a customer manager’s confirmation. 2.4. If it is not possible to reach a customer via the indicated telephone number, You will receive an e-mail. If we do not receive a reply within 24 hours, the order is cancelled. 2.5. If a buyer has not filled all the data or it is not possible to contact the buyer, the order fulfillment may be delayed. 2.6. When placing an order, the customer is responsible for the completed data at the time, and its correctness, as well as, customer is aware of the consequences that may occur if the data is incorrect. If the completed date is incorrect (telephone number, e-mail address) and it is not possible to reach the customer - the order is cancelled. 3. How long a product is reserved after placing order online. 3.1. Customer’s order is 100% reserved for 24 hours only after customer manager’s confirmation. If during this time a payment for the order has not been received or the order has not been collected from the shop, we reserve the rights to put the product into circulation and cancel the order. 3.2. Order is considered confirmed, reserved and processed only when a customer manager has reached you on the phone or has received a responsive e-mail from you. 3.3. If customer has to wait for the product to be delivered from the manufacturer, then he/she has time to make payment till the end of the current week. If during this time the payment is not received or the order has not been collected from the shop, we reserve the rights to put the product into circulation and cancel the order. 3.4. During such busy seasons as Halloween (October 15-31) and Christmas (December 15-31), products are reserved only till the end of the current day (WITHOUT EXCEPTIONS). The products that were ordered for You from the manufacturer are reserved for 2 days, from the time they have been delivered to the store and the customer manager has contacted you. If during this period the payment has not been made, or the order is not collected in the company"s store, we reserve the rights to put the product into circulation and cancel the order. 3.5. If customer places several orders, they can be combined only at the time until another order is placed from the manufacturer. The current order cannot be combined with the next order if that one requires delivery from the manufacturer, because the goods cannot be reserved for several weeks without 100% payment. 4. Order payment, delivery and fulfillment. 4.1. Order payments, delivery ways and their costs are an integral part of this distance contract which is binding for all clients to a full order fulfillment, and is available in the section „PShipping/Payment”. 4.2. Kostimi.lv provides delivery all over the Baltic States. 4.3. All items are delivered to customers in non-transparent parcels, thus the content of your order is not available for others’ viewing, for instance, couriers. 4.4. When making a payment, it is mandatory to indicate the order number. Otherwise the processing of the order may be delayed. All payments are identified by the order number indicated in the invoice. 4.5. One order is sent to one shipping address. One order cannot be split to multiple shipping addresses. 4.6. It is not possible to combine several orders with various recipients in one delivery. 4.7. Every weekday at 12.00 o’clock all previous day and current day payments are summarized. 4.8. If your payment is received until 12.00, then your order will be sent out in the same working day, if after 12.00, then it will be sent out in the next working day. 4.9. Those items that are not available at Kostimi.lv store when the order has been placed, will be ordered from the manufacturer on the next Monday at 12.00 and will be delivered to Kostimi.lv by the next week Wednesday (except when items are not available immediately from the manufacturer or they have a different delivery date). If the order Monday falls on holiday, the order from the manufacturer is carried out on the next working day. 4.10. If in the order there are items that are available at Kostimi.lv shop and items that has to be ordered from the manufacturer, then those items that are available for immediate purchase are reserved for you and later are sent out in one order together with the rest, when order is completed. If You wish to get an order in different parts, you have to pay for shipping as many times as you want to spilt the order. 4.11. Product payment date is the date when the money has entered Marki Group Ltd bank account. Foreign payment from other banks can be received within 1-2 working days. 4.12. Customer is responsible for the timely transfer of payment to the company"s bank account. We can not affect the banking business. 4.13. If You wish Your order to be processed faster, we invite You to send us the bank’s order payment in pdf format via e-mail and notify the manager about this e-mail. If possible, the customer manager will send your parcel out faster (this option is available only for Latvian customers). Foreign customer orders are sent out only after the money has entered the company"s bank account. 4.14. Shipping costs must be paid together with invoice. You do not have to pay separately later to post office or courier when you receive your parcel. 4.15. Product from the manufacturer will be ordered only after receipt of the payment. 5.1. We accept orders from legal entities. These conditions do not apply to wholesales customers who work on contract basis. 5.2. According to Consumer Rights Protection Law, consumer is a physical person who expresses a wish to purchase, purchases or might purchase or use a product or service for purposes not related to his/hers business or professional activities. In other words, "Consumer Rights Protection Law" does not apply to legal persons. 5.3. Waybills for legal entities are placed in order and sent along with the product in one parcel. After sending the order out, client managers will not be able to add any waybills. 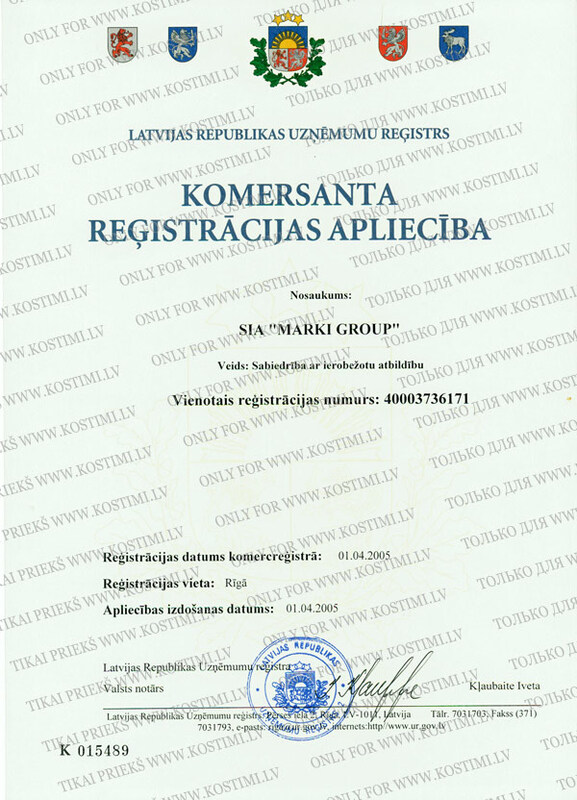 The delivery service mark for Kostimi.lv serves as a fact of product handover. Claims on product consistency/ quantity are accepted on the day when the courier has delivered the package or it has been received in the post office. After that day – none of the claims are accepted. 5.4. If you wish to collect order from the company’s store and you will need a waybill, it is mandatory to make an order on the Internet. If you will not make an order on the Internet, a clientWhen a legal entity purchases a product in Kostimi.lv store without the order on the Internet, client managers will not be able to make/add a waybill. In this case client manager will make a receipt that will be added to the purchase slip. 5.6. When making a purchase in Kostimi.lv store, the managers will not stamp receipts and waybills. According to the facts that “Regulations of formatting and development of documents” have become invalid (The Republic of Latvia, Cabinet Regulations No.154), the stamp has its decorative importance and its use has not a legal claim. 6.1. Kostimi.lv provides products delivery via PDP, OMNIVA and POST OFFICE (hereafter – delivery service). 6.2. Kostimi.lv can not speed up or otherwise affect delivery service’s delivery dates. 6.3. For the customers outside the European Union, the shipment inspection and customs control time is not included in the transfer time because Kostimi.lv and delivery service is not responsible for customs operations and control time. 6.4. The transfer time can change due to weather, the situation in destination country, as well as, different reasons that do not depend on Kostimi.lv. 6.5. If Your country has special requirements of how the package is supposed to look like, please, warn our client managers by writing this information in comments. The client is responsible for passing on such information. 6.6. Delivery dates and prices are available in section „Payment/delivery”. 6.7. When sending out the product, our managers will warn You and send a package tracking number to Your e-mail. 6.8. When choosing delivery via delivery service, a buyer is responsible for the delivery address and other significant information that is necessary for parcel delivery (such as door code). 6.9. In case if the parcel does not reach You within the time deadline, please inform us so that we could immediately arrange everything. 6.10. Please keep in mind that delivery services are not commanded by Kostimi.lv and do not deliver information whether the delivery has been carried out in time. Therefore, if any delay occurs, let us know. Kostimi.lv cannot affect delivery services. 6.11. If You are dissatisfied with delivery services and You wish Your parcel to be delivered by other company - you can arrange your own courier providing all the necessary actions independently. 7. Purchase of products in the store. 7.1. You can purchase the products in the shop without making order before. 7.2. The available quantity of each product is marked next to every item individually. 7.3. Kostimi.lv does not guarantee 100% availability of the desired goods in the store, if a customer has not placed an order in the e-shop. 7.4. We guarantee 100% reservation of items only when a customer has placed an order in the e-shop and has received confirmation from client manager about the reservation. 7.5. The reservation of goods is carried out by the rules stated before in the section ‘How Long A Product Is Reserved After Placing Order Online’. 8. 8. The available quantity of goods in the manufacturer’s and Kostimi.lv stock house. 8.1. On our website in particular fields every item has information about its availability in Kostimi.lv and the manufacturer’s warehouse. 8.2. The given dates and quantities usually corresponds to the real situation. Synchronization with the manufacturer"s warehouse is held every hour. 9. Regarding the impossibility to deliver goods because of sales reason. 9.1. There are cases when the item is out of stock. 9.3. Kostimi.lv informs customers in case if the item is out of the manufacturer’s stock or the order fulfillment date is prolonged. 9.4. If the ordered item is the manufacturer’s warehouse is out of stock, You will be informed via e-mail telephone. 10. The process of order refusal and product return. 10.1. According to The Customer Rights Protection Law, You have rights to return the goods during 14 days since the day You received the order, if You do not like it/size does not fit or it is not what you expected. 10.2. The returning items cannot be used (without cigarette smell, perfume or other smells, without makeup spots, pulled out threads etc…). We do not take back the goods with damaged original package. 10.3. If the condition of the product you returned is deteriorated because of the improper usage of this item, Kostimi.lv keeps rights not to take it back. 10.4. Due to hygienic reasons during 14 days the customer DOES NOT have rights to return such items as: wigs, underwear, stockings, tights, as well as sets of underpants, stockings, socks and/or tights. a. a. Item in its original package must be sent to the return address showed on the parcel. b. In case of defective goods, add a receipt for returning expenses. c. A completed “Withdrawal Form” must be added too. d. Item must be sent back via Latvijas Pasts (Latvian Post). e. The cost of item return is covered by the buyer. f. You may bring the product back to Kostimi.lv shop personally, with a filled-in form. a. a. The law prescribes that money must be refunded to the customer within 30 days. We usually return money within 14 days. b. You will not receive a refund for product’s delivery to You, you can received your order in our Store for free. c. If You send back just a part of order, money for delivery is not to be returned to you. e. In case of defective products we ask the customers from Latvia to send us an email containing a photograph of a defective product and we would make sure that a courier comes to You to receive the product and filled in form and delivers them to us. Honorable customer, this opportunity is a free wish of Kostimi.lv, and it is not determined by the law. If it is not possible to detect a defect of product by a photograph, You have to ensure the return Yourselves. f. If You are not satisfied with the material, color, seam or any other detail, and You think that You could do it better- is not considered to be a defect. g. Refunds can only be transferred to customer’s bank account. 10.7. The process of order refusal and product return refers only to the orders that were sent to client through post or courier, because the customer in this case has no opportunity to get acquainted with the products during purchase. These conditions do not apply to the product that has been bought in person in Kostimi.lv shop. These conditions do not violate Your consumer rights. None of the laws does indicate that customer can return the product that has been purchased in person and Kostimi.lv does not offer this opportunity either. 10.8. We will not accept the product back if it is damaged because of Your careless behavior. 11. Gift Cards, Coupons, Discount Codes. 11.1. Gift cards, coupons, discount codes are established for receipt of various discounts in the internet shop Kostimi.lv and are not referred to delivery costs. 11.2. Discounts, coupons and discount codes cannot be added together. 11.3. When placing an order You can input only one discount code, coupon or gift card code in the given field. 11.4. Gift card, discount code or coupon is valid only till particular date and it is cannot be prolonged. 11.5. If the buyer has placed order, but has not input a discount or coupon code, and has paid the invoice, neither of discounts can be applied and buyer cannot ask for the return of difference. 12.1. The protection of data is the priority of Kostimi.lv! 12.2. We will not sell, rent out or in any other way deliver Your personal information to third parties without Your permission in written form, apart from cases, when legislation of the Republic is broken. 12.3. We keep personal data (first name, last name, address, telephone number and e-mail address), which is necessary for fulfillment of order. If necessary we hand it over to the third parties (for instance, delivery service and accounts department) for order fulfillment. 13.1. Kostimi.lv distance contract is constituted with the laws in force and we stick to examples of good practice. 13.2. If for some reason, these rules do not seem for you to be binding and are you dissatisfied with something, please, do not to make an order in this e-shop. 13.3. In case of disagreement, all disputes are always settled on the basis of this distance contract and legislation of The Republic of Latvia. 13.4. Kostimi.lv is not responsible if a buyer is familiar with these terms. When placing an order in the e-shop, each customer has a duty to get acquainted with the working principles of Kostimi.lv. 13.5. Kostimi.lv employees do not have the possibility to change the distance contract, as well as Kostimi.lv employee behavior is completely based on this agreement and the principles of equal treatment of all customers, without exception. Last Correction Of this Distance Contract: 29.11.2016.